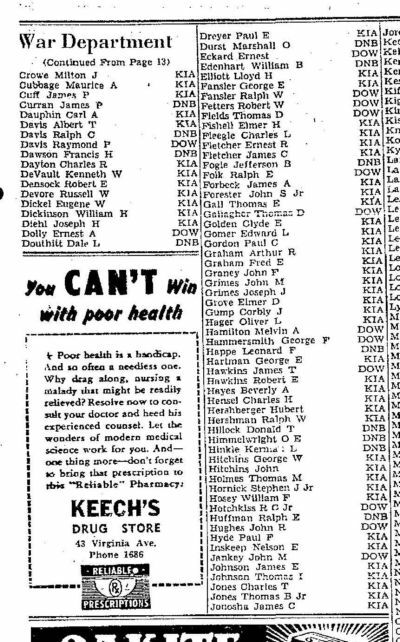 Thursday, June 27, 1946; Times, Cumberland, MD. The first consolidated postwar casualty list issued by the War Department today contains the names of 282 soldiers from Allegany county who went off to war and failed to return. It does not list the casualties in the Navy and Marine Corp.
On December 7, 1945, the fourth anniversary of Pearl Harbor Day, the Times office casualty file showed a total of 322 war dead, 183 from the city of Cumberland, and 139 from other county communities, including all branches of the armed forces. Since then 11 other city and county men have been reported dead, making a total of 335 who have died while in military service. 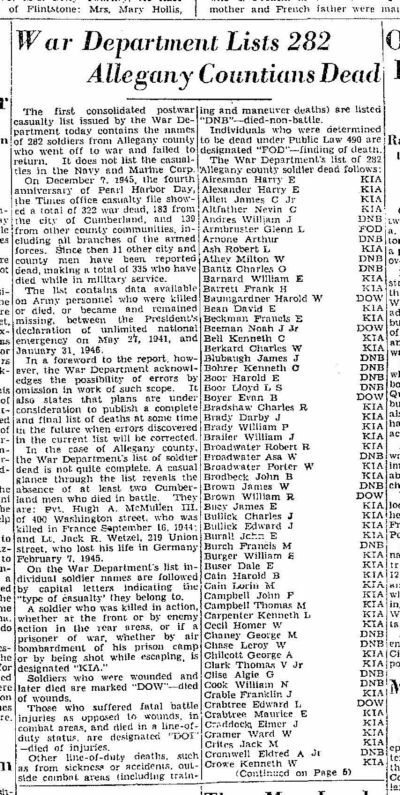 The list contains data available on Army personnel who were killed or died, or became and remained missing, between the President’s declaration of unlimited national emergence on May 27, 1941, and January 3, 1946. In a foreword to the report, however, the War Department acknowledges the possibility of errors by omission in work of such scope. It also states that plans are under consideration to publish a complete and final list of deaths at some time in the future when errors discovered in the current list will be corrected. In the case of Allegany county, the War Department’s list of soldier dead is not quite complete. A casual glance through the list reveals the absence of at least two Cumberland men who died in battle. They are: Pvt. Hugh A. McMullen III of 400 Washington street, who was killed in France September 16, 1944; and Lt. Jack R. Wetzel, 219 Union street, who lost his life in Germany February 7, 1945. On the War Department’s list individual soldier names are followed by capital letters indicating the “type of casualty” they belong to. A soldier who was killed in action, whether at the front or by enemy action in the rear areas, of if a prisoner of war, whether by air bombardment of his prison camp or by being shot while escaping, in designated “KIA”. Soldiers who were wounded and later died are marked “DOW” – died of wounds. Those who suffered fatal battle injuries as opposed to wounds, in combat areas, and died in a line-of-duty status are designated “DOI” – died of injuries. Other line-of-duty deaths, such as from sickness or accidents, outside combat areas (including training and maneuver deaths) are listed “DNB” – died-non-battle. Individuals who were determined to be dead under Public Law 490 are designated “FOD” – finding of death. Numbers do not add up to this total. I may have read the article incorrectly.